We set ourselves to press & ferment these apples on a small scale. We made mistakes (a carboy was lost to the infamous 'white film) and underestimated the cleaning time (ugh). These ciders came through for us - it had been a long hot summer & the apples were concentrated in sugar and flavour. We had tannins from the crab mixes and complexity from all the varieties of apples put into the mix. Wild apples are usually grown from seeds. Both seeds that are deposited by wildlife (birds/deer eating apples) as well as (in areas where people have been for a while like Prince Edward County) apple cores being thrown out of car and train windows (aka Road Apples). When an apple is grown from seed, it is not true to it's parent apple; it's a mix of the apple you've eaten + the apple pollen that fertilized the bloom. Every single time it might be different (mind blown with the possibilities). Which is why the apples can be amazing for cider - they are often a mix of eating & crab apples. The best are the 'spitters', the ones that dry your mouth out & which you wouldn't want to eat raw. Looking forward to Fall 2018 - we want to repeat this trial batch on a larger scale & we need help. We want to fill at least a bin with a mix of local, wild apples. We need the community's help to do it - bring us your wild (uncultivated) apples. 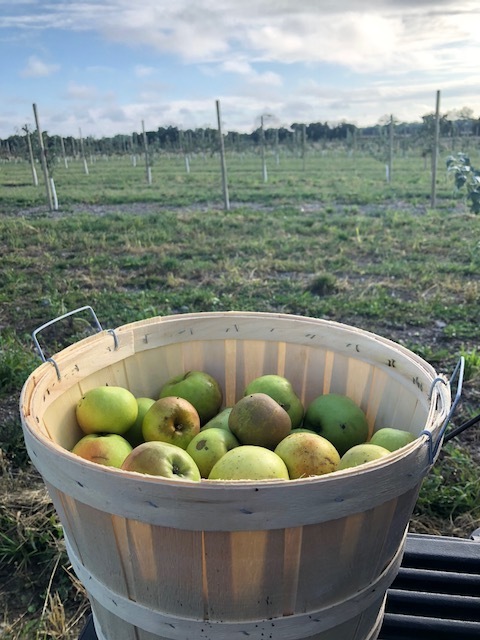 You will be rewarded for your efforts - pricing per bushel to be set based on apple size (the smaller apples, the more valuable- we know they take longer to fill the bushel!). Details: You must have permission of the landowner to pick any apples. We will need a photo of the tree and location where the apples were sourced. We will also need (for licensing reasons) you to sign to say they are 100% Ontario apples. If you know of wild apples that are available to be picked but are unable to do it yourself, please let us know & we will come and get them. Email settlerscider@gmail.com and we can send you suggestions on how to pick the large trees & what to look for to determine ripeness. More information to follow soon, but look out for the blooms in the Spring/Summer as it's the best time to scout your trees!